Tiered Gift Sets of 12, 24, 48, 60 & 90 - Includes 12, 24, 48, 60 or 90 of Pitt® brand drawing pens with brush nib. These special sets come in attractive reusable studio boxes that keep pens organized. Please refer to the Item Tech Notes Icon for a complete listing of set contents. Set of 90 comes in a quality, latching wood box. Pigmented drawing ink is extremely lightfast and waterproof. Long lasting pens are convenient to use and all are pH neutral and acid free. Unique brush point ensures an even flow of ink, gliding gently and smoothly over the paper while retaining its shape even after constant use. By varying the angle you can achieve a personal touch to your script or lines—fine, medium, and broad strokes are possible, but also shading of various kinds. The high-quality brush point works both straight and bent without breaking. While the light colors are transparent and, thus, well-suited to varnishing techniques, the dark colors have good covering qualities. 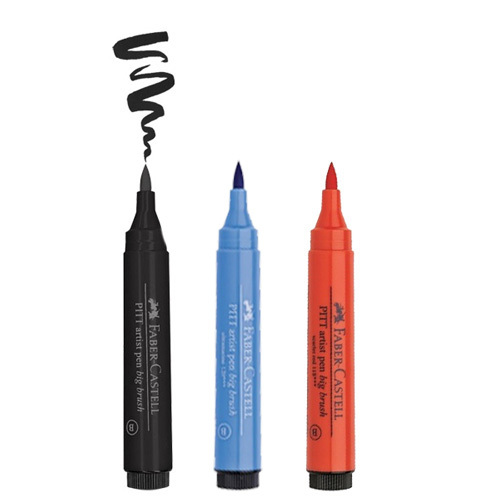 Pitt® Artist Pens have unsurpassed light-fastness. They are odor-free, acid-free, pH neutral, light resistant, water-resistant, and permanent pigmented drawing ink pens. Buy the Faber Castell Pitt Artist Brush Pen Set of 60 or 90, get 3 FREE pens! (a $29.99 value) FREE*! *Limit 1 per order. Free item ships automatically w/qualifying purchase. Free brush pen(s) color is chosen at random. While supplies last. Buy the Faber Castell Pitt Artist Brush Pen Set of 24 or 48, get 2 FREE pens (a $19.99 value) FREE*! Faber-Castell Pitt Artist Pen Sets is rated 4.9 out of 5 by 22. Rated 5 out of 5 by Xochiquetzal from Love them I love these collection! The quality is great, is better to invest in these pens, rather than cheaper brands. Rated 5 out of 5 by Bobcolts from Small but great pens Small but great pens at a Outstanding Blowout Sale Price!!! Got the 60ct. box for $69.00. Rated 5 out of 5 by sparkle536 from Love these brush pens! I'm using these brush pens in art Journaling and card making. Just love the color choices and how smooth and evenly these lay down colors. Rated 5 out of 5 by Grandpa Steve from Its Faber-Castell, its got to be good. Love these things. No more hoge-poge of Pens, got the whole set and a very nice case to keep them in. Don't bother asking, you can not barrow them. Rated 5 out of 5 by rose collins from excellent product These pens work beautifully with acrylics in a mixed media painting. I was using comic pens and the ink can not be covered with acrylics which is a nightmare. are these good for pointillism? if so, how many should I get? Yes, the Pitt pens can be used for pointillism. The set that you order would depend on the amount and type of colors that you would like to use in your compositions. Please let us know if you have any other questions or concerns. What colors are in the 12 set? I have a 6 pen set, with black, brown , a bright yellow, sanguine and 2 type of red. What colors does the 48 set contain? Are these pens contain India ink? The Faber-Castell PITT Artist Pen Box Set contains 90 Pitt Artist Pens beautifully presented in a varnished wenge-wood gift case. Faber-Castell is one of the world’s largest and oldest manufacturers of pens and pencils and their PITT pens continue to be the first choice for many graphic artists, designers, illustrators, and fine artists. 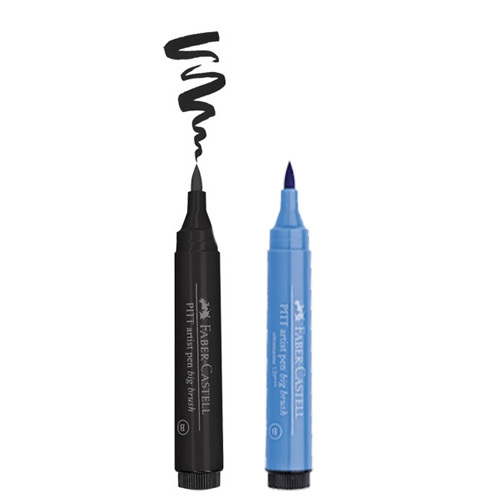 These pens feature permanent, waterproof, lightfast Indian ink. This extensive set would be a perfect gift for any creative looking to own a serious-superb quality pen collection. This Pitt Artist Pen wooden case contains 60 x coloured brush pens, 6 x metallic brush pens, 3 x calligraphy liners, 18 x fine liner and 3 x speciality nib pens. Set of 60 includes the entire range of Pitt brand drawing pens.Special set in attractive reusable studio box that keeps pens upright and organized at all times.